“History is written by the victors,” goes an oft-quoted maxim. In the case of the history of our Congregation, history has been written by the ordained. Most members can name at least a few of the pioneering priests of the C.PP.S., but how many can name a brother from those early years? In 1880, Don Enrico Rizzoli, moderator general of the Congregation, penned a little volume entitled Brief Outlines of the Life and Virtues of Some Members of the Congregation of the Precious Blood. The expected names appear: Bonanni, Tani, Merlini, Valentini and so on, but several pages are given to the biography of a noteworthy brother: Giosafat Petrocchi. Little is known about Br. Giosafat’s early life, since he was born in the middle of the 18th century, and Rizzoli was writing nearly sixty years after his death. 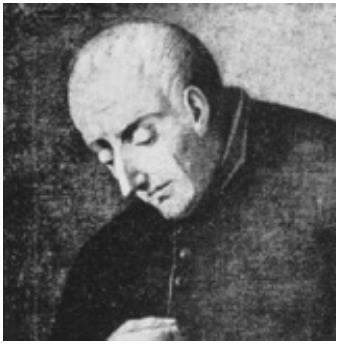 He was married and had children, and was a man of “singular innocence, great humility, charity toward the poor, and with the simplicity of a dove.” He had a special devotion to the Virgin of the Holy House of Loreto, not too far from his home town of Sant’Elpidio in the region of the Marches. After the death of his wife and when his children reached maturity, he left the Marches and went to neighboring Umbria. There he worked to reawaken the faith among the people. He continued to work as a tailor and lived in voluntary poverty. He was well received by the people because of his loving, attractive personality. In the morning he would invite people to pray in thanksgiving for a good night’s rest, and during the day he would speak to them about the lives of the saints or of Jesus and Mary. He led them in the rosary and gave religious instruction. His efforts bore great fruit among the people. When St. Gaspar opened the first mission house in Giano, Petrocchi, happy to hear of the new Congregation, presented himself for service. St. Gaspar accepted him even though he was 70 years old, because of his sterling reputation. [He] was one of the first brothers in service. He was of irreproachable conduct and received the Sacraments frequently. Even though he was of advanced age, he lent himself to all sorts of tasks … and was the sacristan at San Felice. He passed his time in adoration … he read devotional books, often hidden in the crypt near the tomb of Saint Felix … He was also very devoted to Mary and often liked to visit the nearby sanctuary of Maria del Fosco to venerate the miraculous image there. Good [Brother] Giosafat suffered a great deal from being treated badly by some of our members. He was, however, always patient in spirit and put up with the bad treatment he received with admirable joy, without complaining to the superiors. Merlini goes on to say that Giosafat hid his sufferings as much as possible. He also seems to have been gifted with great wisdom and insight. For example, he predicted that one member would leave the Congregation when assigned to another house, and he reassured another member who had some doubts that he would persevere until death. Castagnola heard of the death of this good old man, they cried as if they had lost a saint. They took some strands of hair and other items to be preserved and venerated.” At least one miracle was attributed to him after his death. Another early Missionary, Don Vincenzo De Nicola, visited his tomb often and regarded Br. Giosafat as his protector. Don Vincenzo died only 18 months after Br. Giosafat. St. Gaspar called the mission houses of the Congregation “continuous missions.” While never preaching a mission, Br. Giosafat certainly helped to make the mission house in Giano a continuous mission.